By Mark - Thailand - 23 Dec/03 - Viewed 1683 times. Before heading to Krabi we decided to pop back across the Malaysian border to renew our visas as they would probably run out before we got to Cambodia. We got a songthaew to the border, got stamped out, waited about 30 seconds and then got stamped back in by the same immigration official. We found it all a bit strange but he was obviously used to it. We had to wait around a bit for a ride back to Satun so altogether it probably took about 2 hours. Back in Satun we checked out of the hotel and got a bus to Trang. At Trang we changed onto a bus for Krabi and at Krabi got a songthaew to Ao Nang beach. The driver annoyed us by following us around until we found a hotel and then claiming commission for bringing us there. The first night we stayed in the KL Guesthouse for 900B in a really nice room. However, the next day we moved to Sabai Mansion as it was the same price but had a swimming pool. We relaxed by the pool for a few days and ate out in the numerous tourist restaurants. It was the first time for a while we had been able to get western food like pizza. 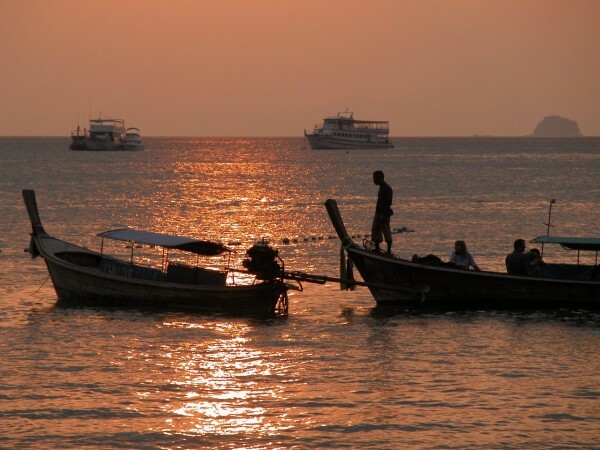 Ao Nang is totally different from Ko Lipe - it is packed with package tour tourists and tourist shops. The only day trip we did was kayaking through the sea caves. This was very good and well organised. The sea caves are only accessable at low tide and we saw fiddler crabs and mudskippers walking about on the mud flats. The trip included a good lunch and a visit to a crystal clear river in the afternoon for swimming. Laura was sad to leave the pool behind but finally we had to set out for Khao Sok. We decided to take a tourist minibus as we thought it would be quicker and we were feeling lazy. However, we soon wished we had taken the public bus. The minibus picked us up and then drove round Ao Nang for 30 minutes. It kept stopping at hotels but not picking anyone up. Eventually we made it to Krabi where we got out and had to wait an hour for another minibus. The purpose of this wait was for the tour agency to try and sell us hotels, transfers and anything else they could think of. If we had wanted we could have booked up the rest of our Thailand trip with him. We declined to book anything, even though they said that when we got to Khao Sok we would be stuck by the roadside miles from accomodation unless we booked in advance. This turned out to be a lie - the minibus actually dropped us at our chosen guesthouse. The hotel we stayed in on Ao Nang beach. One of the cheapest with a pool.